The first full weekend of December is delivering a hell of a lot of good times all across the metro area. This starts a series of non-stop shows from now until either the end of the world or the end of the year…whichever comes first. This last stretch of 2012 is filled to the brim with amazing shows and album releases galore. What better way to usher in the holidays than with copious gifts from our favorite bands and musician friends. Several bands (now four at last count) have even recorded holidays songs to keep your spirits bright, but more about that next week. The party begins tonight and really, there are just too many places to be and too many shows to see all amazing in their own way. Tonight really shows off the diversity and the excitement of what is happening with Arizona Music. This is an amazing evening and no matter where you end up you are sure to have a fantastic time. Granted I’ve spotlighted four shows below, but there is a lot more going on than just these four–so find your niche and promptly get your groove on. Amidst the madness and chaos that is First Friday in Phoenix, one special event stands out above all else. On the outdoor stage between Tediberto’s and Carly’s @ 110 E Roosevelt St check in to catch Haymarket Squares, Small Leaks Sink Ships and Future Loves Past Perform–not only on the stage, but the roof, yes that’s right the roof of Tediberto’s. There will be interviews and filming going on as well as the footage will lead to a submission reel for Balcony TV. Haymarket Squares start on the roof at 6:45, then return to Earth for a set on the outdoor stage. Small Leaks Sink Ships follow at 8pm, with Future Loves Past bringing down the house starting around 9:15pm. 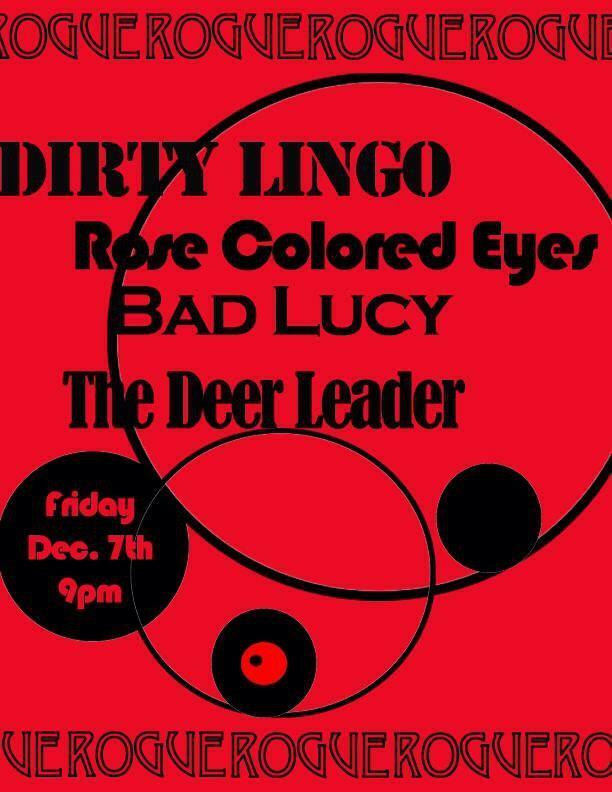 Rogue Bar has a great show going and it’s probably the last time this year that you can catch Bad Lucy live, as they are about to hibernate into a fit of songwriting and recording. This is a solid lineup that won’t leave you disappointed. Plus, its the Rogue, which means great sound and good drinks for reasonable prices–but remember to bring cash, something I always forget until I walk in the door and remember the ATM hates me there. Let’s face it, the Yucca Tap Room was THE place I got my start writing about live local music in this town–when I started writing about the scene nearly five years ago, this was where it was all happening. Now, they have to share their importance with half dozen other venues, but still I do love the Yucca and all that it represents. Tonights show is a fantastic lineup, but it’s my understanding that Sara Robinson may not make it because of a thrashed throat (tis the season). 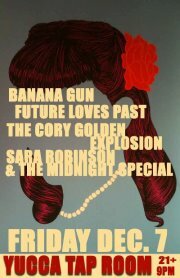 The show is free and though Sara & Co. might not make it, the lineup is still pretty damned immaculate. If you are looking for something truly different to do tonight, perhaps in the mood to get out of your element, I highly recommend this show. 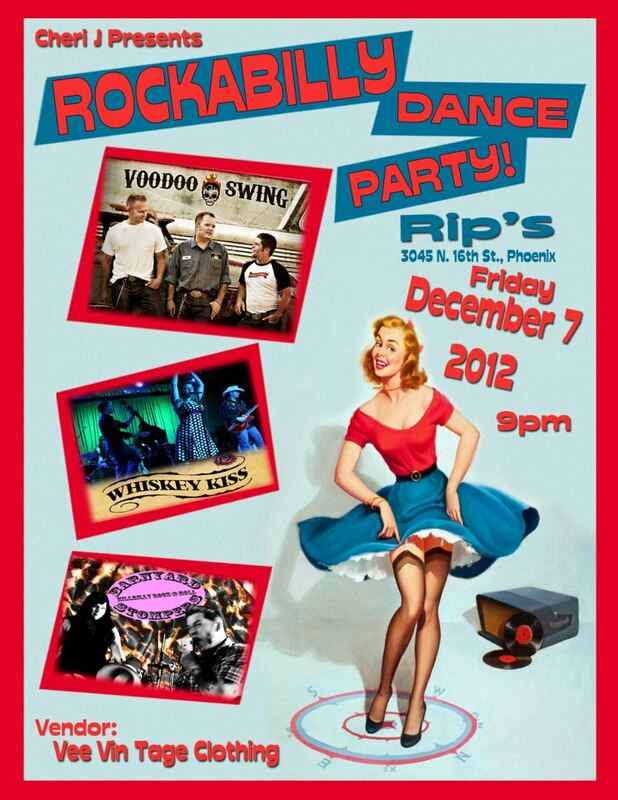 First of all, there’s almost nothing more fun than a Rockabilly Dance Party–the retro joy alone can carry that energy a long way, but also, these bands, especially the ultra-amazing Voodoo Swing are just sheer fun. This should be a booze bathed evening presented by Cheri J featuring Vee Vin Tage Clothing on site selling vintage dresses. This Saturday, once more, delivers too many decisions to choose from. Once more Future Loves Past is in the mix as they seem to ceaselessly play everywhere at once, ever night of the week. Another amazing aspect of shows this weekend is that two of the four shows below are for purposes of charity. Nothing shows of this season better than a bit of altruism, compassion and kindness. I expect some more of this as the month goes on and I already have some heads up on future events of this nature. I like the Ice House Tavern because it’s just so damn weird. Where else can you watch cool music, play a jukebox that consists nearly entirely of local musicians that have played there (Art For Starters! ), sip some brews and to your left see people getting the hell beat out of them on a full sized hockey rink? For $5 you get to catch three great bands and enjoy a very weird time. 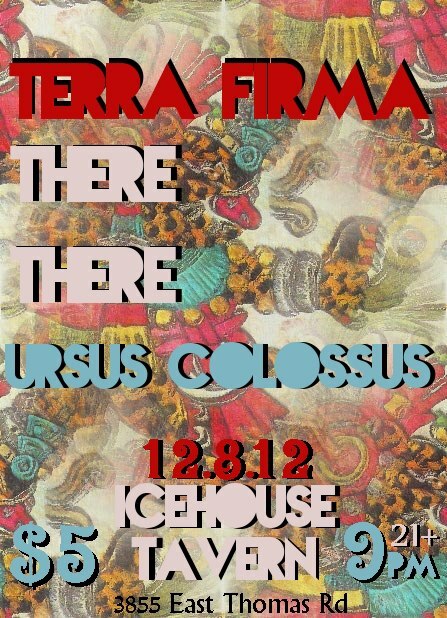 Be sure to check out Terra Firma, they are approaching 2013 with one of my most eagerly anticipated new albums. 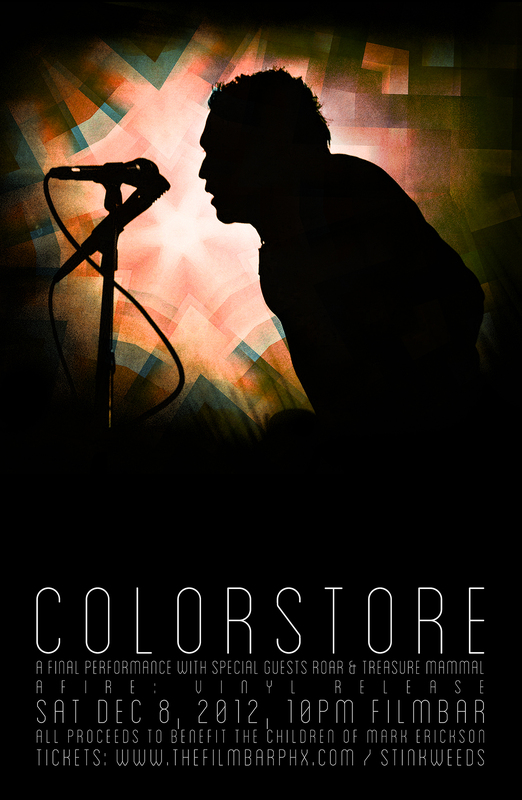 If you have ever enjoyed Colorstore during their years in this great city, you may want to be at FilmBar on Saturday night as this is the last chance you will probably have to catch any permutation of the band ever again. With the passing of Mark Erickson, this event marks something of an end to an era. Not only will there be wonderful performances by the members of Colorstore from all stages of their career, but the vinyl edition of their final album Afire will be released as well. With support by ROAR and Treasure Mammal, this is sure to be an emotional, beautiful and amazing event for all who loved Colorstore and Mark Erickson. All proceeds go to benefit Mark’s children, Sophie and Jack. How do they do it? Three gigs in two days? Well, mostly it’s because they are one of the most amazing bands in the city, bar none and one of my top five local faves. Here is a band who had more than enough songs to make an album nearly a year ago, based on their debut EP and a slew of crowd favorites they had developed on stage and in their home studio, only to take a complete 180 degree turn to deliver a 12 track concept album based on Our Solar System. 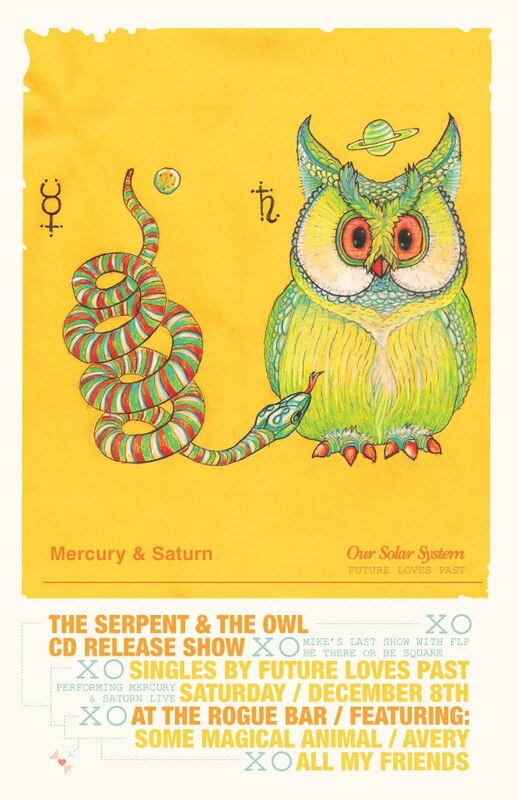 Saturday night, Future Loves Past is releasing the double A-Sided singles for their tracks in homage of Mercury and Saturn. Stay tuned to SoundsAroundTown.Net for a thorough review of both brilliant songs next week. In the mean time you may want to get to Rogue to pick up this limited single release and enjoy the show with support from Some Magical Animal, Avery and All My Friends. Now here is another truly magical event. 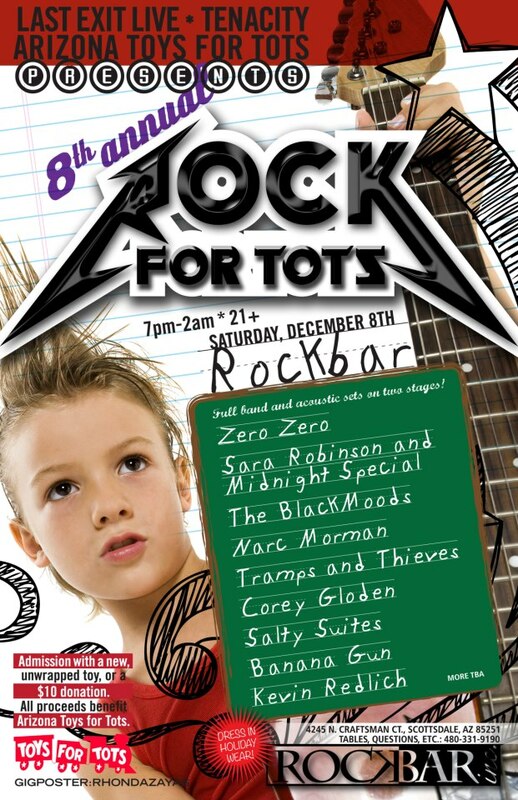 The 8th Annual Rock For Tots, brought to you by Arizona Toys For Tots, Tenacity, Last Exit Live and Rockbar. A true celebration of local music and the holiday spirit of helping out those less fortunate. Ten bands, two stages, non stop music that starts early and runs late. From 7pm to 2am you can show up with a $10 donation or an unwrapped gift to get in, but you must be 21 or up. All proceeds benefit Arizona Toys for Tots and the lineup is out of this world: Zero Zero, The BlackMoods, Kevin Redlich (Quick Henry), Sara Robinson and The Midnight Special (maybe…depending upon illness), Corey Gloden, Salty Suites, Narc Morman, Banana Gun, We Were Strangers, Lawarence & Dani Zubia, Tramps and Thieves. It’s a great cause and a great show, not to mention raffles going on all night with some amazing gifts to bid on!